Ghost Train « Vancouver Spotlight – Your Station! Your Stories! Ghost Train is an annual Halloween themed event that takes place in Vancouver’s Stanley Park. Every year a train takes passengers through Stanley Park on a scary themed ride; this year’s theme was ‘Ghost Pirates’ and by the response of eager train goers it was a hit. The ghost train started in 1999, and every year since, along with Vancouver Parks, they’ve run a different theme. “A little bit of scariness and a lot of inventiveness,” says Carrie. The footage of the train passing through the trees shows amazing pockets light shows and acting, creative scenes that scare and delight the people on the train. Little kids have their faces painted and most wear pirate hats, and amazingly enough, the parents seem just as happy to be there as their kiddies. If you missed a ride on this year’s ghost train, make sure you come along next year for another scary theme. Visit www.vancouver.ca/parks for more information. 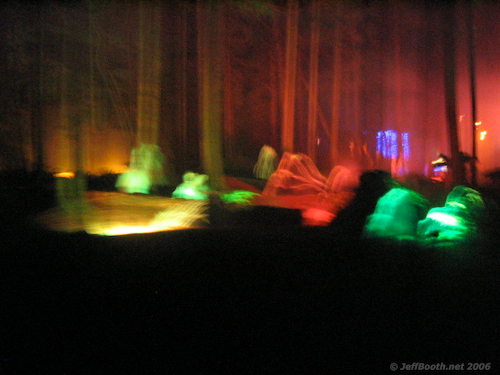 This entry was written by vanspotlight and posted on November 1, 2008 at 4:54 am and filed under Arts, Family Activities, Outdoor Activities with tags ghost, ghost train, halloween, kids, mortal coil, night, pirate, ride, stanley park, train. Bookmark the permalink. Follow any comments here with the RSS feed for this post. Post a comment or leave a trackback: Trackback URL.